Miters, who doesn't love them thanks to mason-dixon knitting... I am working on a miter project of my own. Now all i can think about is all those loose ends to weave in, I have some work to do. To celebrate March 1st (remember that lion/lamb theme for elementary school?) we will have an amyville giveaway contest tomorrow! I decided to try my had at the Ogee Lace Skirt from the summer 07 issue of Interweave Knits I am using a cotton/acrylic/viscose mystery fiber I have had for years--- its like a tweedy cotton with little nubs of color. My goal is to have this ready for an upcoming trip in May. 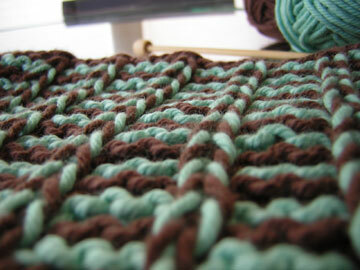 I am really enjoying this pattern-- no crazy 8 row repeats, instead following a chart with 29 row motifs. Yeah, there has been some knittin going on. I have to admit, I have a fiber addiction... and I am not ready to share pictures or details with the world anytime soon. I have saved clippings from fashion magazines, started an idea book, a sketch book, a project book, created a few spreadsheets and placed patterns in plastic sleeves in binders...2008 it is time to CREATE more. 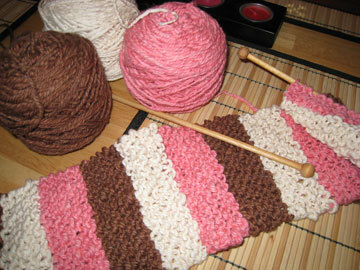 If you have some extra mason-dixon inpired kitchen (you know what the ball-band dish cloths are made of!) 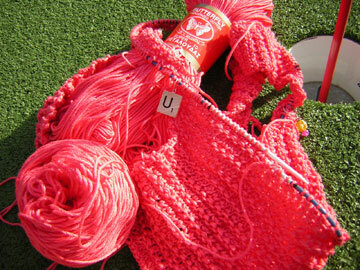 cotton lying around... and there are babies in your circle of influence :)-- may I recommend making them some legwarmers! I made a set for little Lilly-pie. 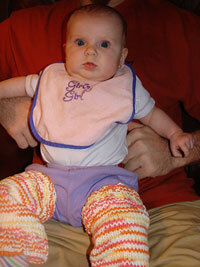 Its' basically knitting sweater sleeves- that will protect her legs/knees/clothes when she starts crawling. 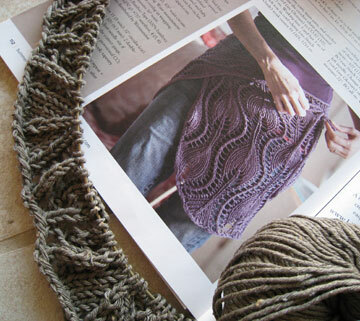 One of my favorite knitting books is from these divas of knitting. And after I found out there will be some new babies (work friend and family friend's daughter) making their appearance this summer and fall- I had to get some more baby knittin' in the groove. 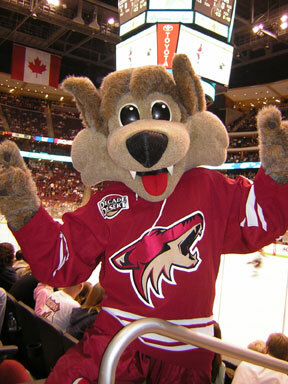 Mr. Mark got us 6th row tickets to the Coyotes game Saturday night. They were awesome seats right in the Coyote's attack zone-- only a few pucks came over the plexiglass. Getting back to basics... in between amyville orders I have been crafting and organizing, not sure where our weekends go as it's already Sunday night! I have no craft update pictures to show, since a back of a sweater in stockinette is just pain boring- and my knitted babe doll just looks like swatches, and I am re-engineering my katia jaimaca top. My organizing highlight is my 80s sticker collection...yes I collect stickers still- my focus this weekend was my TREND collection. Any readers out there that still dabble with the vintage stickers? Check out Bubbledog's full site for a blast from the past! And lastly-- I have found another great kawaii-goodness online store based out of the San Fran. Yeah, still one of my favorite one liners from one of my guilty pleasure shows...Blow Out. To experience the Jonathan phenomena, I thought I would try out some of his products-- Dirt is my favorite- and I am a sucker for good smelling product. I found this set at my local Sephora in the Chandler Mall. And sometimes all current knitting must go on hold, when a must knit project comes up in the queue...reckon the 100+ degree heat and this sweater don't mix, but one thing is for sure in Arizona, the air conditioning can run might cold in these parts... so I am sure I will get some wear time in- maybe even at work! 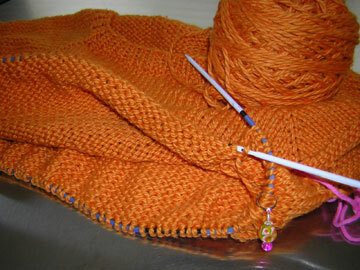 Here is progress on my fad-classic, in a lovely melony punch color. I am so digging this knit! Have you seen this stuff in the stores? 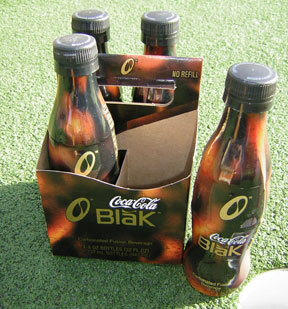 Coke Blak-- it's coffee infused coke! I hope it sticks around, it's quite tasty-- coffee/chocolately coke! And the extra caffeine it boasts gives me more energy for my craftin' adventures! 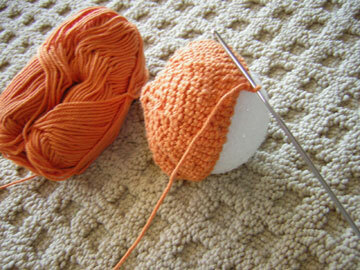 Knitting? 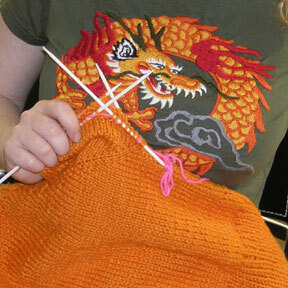 Who has time for knitting? 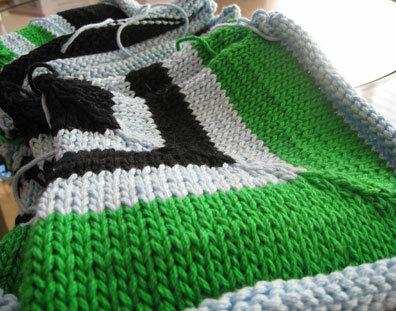 2006 goal number 5046...knit cool stuff for myself. Here is some progress on the mac n cheese cardigan... 2 sleeves to go (along with some steeking and button bands...and voila!) And check out how nicely my dragon matches!